Occasionally I will recommend a product that we personally like and use to improve the camping experience. I am also using this page to build a resource list with categories for your convenience. Those items will be a clickable link here with my recommended gear or in my blog articles for ease in your finding useful products. Just so you know, this blog site includes affiliate links, which means if you click through and make a purchase I may receive a commission (at no additional cost to you). I only share what I believe will be truly helpful. Part of my blog income goes to support RUN ministries, as they work to rescue about 20,000 girls yearly from human trafficking, via their Nepali Rescue Project. There are more slaves around the world today than ever before in history. Sadly, worldwide almost 20% of all trafficking victims are children. These book style maps have detailed info of each state in the U.S.A. A “real” map is great when you have no cell reception or internet! Here is a link to a map of California to get you started. Maps: Los Padres National Forest Monterey & Santa Lucia Ranger Districts. You can buy a map or follow the links to download the map to use offline. I prefer a hard copy. Maps: Tom Harrison map; National Geographic map. Our “go to” maps for 4×4 roads. Both maps are printed on waterproof and tear resistant plastic. Handy tips of what “to know before you go” camping in the desert wilderness of Death Valley. This is a comprehensive guide to all of the National Parks in the United States with gorgeous color photography for which the National Geographic is famous. Camping under the stars with a star chart will help you to learn the names of the constellations and planets. No batteries or cell reception is needed for this manual star wheel. I have the Celestron Sky Master binoculars to enjoy a closer look at the moon and planets. They can double as regular binoculars, but are heavier to hold. 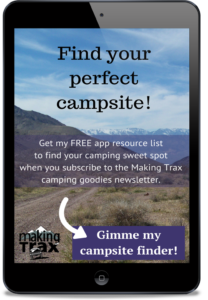 Read my post for more about stargazing while camping that includes my favorite app. If you are a shutter bug and prefer a “real” camera to your cell phone, then check out the Panasonic Lumix FZ300! I love how this camera makes me look good as a photographer! It has so many features that I am still learning to use, but my easy default is the iA setting for the camera’s auto “smart” feature. My favorite feature is the great zoom lens, so I can photograph a wild critter without disturbing it, or get up close to show better detail. It has a self timer as well as the ability to use my cell phone with a Lumix app to act as a remote. However, the app only works with wifi, so I travel with a cord remote. These puppies make all the difference for hiking the back country, giving me stability while reducing fatigue on my knees and feet. I like to use poles with built-in shock absorbers, as over the duration of the hike this lessons the impact on my hands. Hiking poles also are great for testing the depth of a stream crossing or poking debris or brush for snakes if you have to walk through an area where you can’t see your feet. You can change the length for hiking uphill quick and easy with the twisting adjustments on the pole. Our favorite is a double size bag for two people (we are both tall), rated for zero degrees by Teton Sports Mammoth. This cozy bag has 3 zippers (both sides and across the bottom) with drawstrings, baffles in the head section and a comfy flannel lining. This bag served us well sleeping on an air mattress in the back of our pickup truck. Most recently it fits perfectly on our mattress pad in the cab over section of our Alaskan camper. This bag has kept us warm while camping in snow (rated at zero degrees). On warm evenings this bag can get too warm, so we turn the bag inside out to sleep on top with a queen size bed sheet to keep us cool. The best part is not having to make your bed in the morning. It comes with a roomy stuff bag for storage. Enhance your camp cooking with the simple art of grilling on this handy, portable Smokey Joe BBQ by Weber. I like the containment of ashes and lid with adjustable vents. This is large enough to grill 2 steaks with 2 large potatoes. The handle and locking lid make it easy to transport. The smell and taste of smoked, barbecued meat and veggies beats the camp stove cooking method and this little BBQ makes it easy. Basic but a must have. Using toilet tissue that is bio-degradable can make all the difference, especially in a truck camper using a toilet cassette like ours. Prevent clogs and be kind to nature when using a hole dug in the wilderness, without sacrificing softness for your tush. Check out my post on squatting hazards in the back country for what NOT to do when answering the call of nature! I really enjoy the invisible “cheaters” in this pair of polarized bifocal sunglasses . The 1.50 readers really make a difference to see to tie a fishing lure, take out a cactus sticker, or to see the details of a desert flower. You can choose which magnification strength best works for you. I wear the tortoise shell color. I prefer glasses without the nose pieces that like to tangle in my hair when pushed back on top of my head. I am a Stylist for Lilla Rose and their patented Flexi hair clip. I love these clips for practical, easy care of my hair while camping, hiking, fishing, swimming, bicycle and horseback riding. 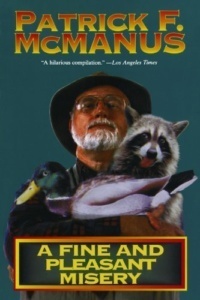 No camping trip is complete without a good book to read! One of my favorite authors is Louis L’Amour with his historical fiction of the old west, often describing areas where we have camped out. Here is a favorite title to get you started, “The Shadow Riders.” Later you can watch the movie. A fun read of witty cautionary tales of outdoor life is, “A Fine And Pleasant Misery“ by Patrick McManus. While relishing being in the wilderness I feel closer to the Creator in “Encountering Our Wild God“ by award winning author Kim Meeder. Where tragedy confronts eternity in a wilderness setting is the story of “The Shack.” I also enjoyed this story as a thought provoking movie which is now available on DVD. For truck camper reviews: truckcampermagazine.com. This is a great online resource to compare brands and find reviews by other real life campers. The telescoping Alaskan camper: alaskancampers.com. After years of research we decided on the Alaskan camper for giving us the creature comforts we want while camping in the back country. Here is our story of our quest for a truck camper.